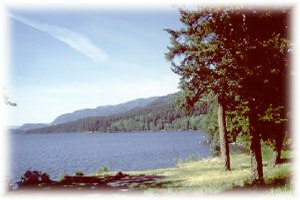 Niskonlith Lake offers rustic camping and is popular for swimming, fishing and boating. There are limited facilities, so campers should be self-sufficient. Due to limited facilities, only small car-top type boats can be launched at the park site. The nearest public telephone is at Chase, 8 km away. 8 km of gravel road, northwest from Hwy #1 at Chase (east of Kamloops). The closest communities to this park are Chase, Scotch Creek, Sorrento, Salmon Arm and Kamloops. Approved Purpose Statement and Zoning Plan [PDF] for Niskonlith Lake Provincial Park is available in pdf format. Canoeing and kayaking are popular. Cycling is permitted only on roads. Fishing is popular at Niskonlith Lake for kokanee and rainbow trout. Anyone fishing or angling in British Columbia must have an appropriate licence. There are opportunities for scuba diving. The lake is popular with beginner divers. There is no designated swimming area. There are NO LIFEGUARDS on duty at provincial parks. There is an excellent opportunity to view the Chase community, the Thompson Valley, and Little Shuswap Lake as you climb out of the valley on Niskonlith Lake road on your way to the park. Many of this parks trails are suitable for cross-country skiing and snowshoeing in the winter months. The trails are not maintained in the winter months. There is limited road access to the Park entrance during the winter. There is a launching area for car-top boats. Niskonlith Lake has a 10 horsepower motor restriction. Firewood can be purchased from the Park Operator in some parks or you can bring your own wood. Fees for firewood are set locally and may vary. To preserve vegetation and ground cover, please don’t gather firewood from the area around your campsite or elsewhere in the park. Dead wood is an important habitat element for many plants and animals and it adds organic matter to the soil. You can conserve firewood and air quality by keeping your campfire small. Bring a portable stove for cooking. This park offers 29 vehicle accessible campsites on a first-come, first-served basis – campsite reservations are not accepted. Most of the campsites within the park are suitable for campers and small trailers only; however there are more open camping spots at the south end of the campground that may allow for larger trailers. Most sites are shaded. There is no gatehouse at this park. There is limited parking for extra vehicles. The operating season for this park is May 15th to September 15th. The park may be accessible earlier and later depending on weather. Self registration – please choose a site and self register at the pay station.